It is said that it pays to be fearful when others are greedy and greedy when others are fearful. In early 2009, the Russian Trading System suffered a fourfold drop from the high-water mark of mid-2008. However, it was the emerging markets that showed the most dynamic growth during the rebound in the first half of 2009. In fact, the first half of the year turned out to be an excellent time for the greedy. So, is the second half of 2009 a time to change strategy? When assessing the Russian economy's prospects, you have to consider several aspects. First, the latest statistics from Rosstat and the Ministry for Economic Development would seem to indicate that the worst is over. The Manufacturing and Services Purchasing Managers' Indices also suggest we are seeing the first signs of recovery. However, as Russia's economy grows, obstacles are still a possibility, and we may witness certain indicators "slumping" in the future. Second, with its export-oriented economy, Russia depends on how the world's biggest economies are weathering the financial turbulence. Nevertheless, we have reasons to be optimistic: "One cannot but notice the first signs of the global economy recovery," said prime minister Vladimir Putin. Analysts agree. Many economists in the financial markets have, by and large, been upgrading their GDP forecasts in response to better-than-expected data. Additionally, the US hopes to see the maximum effect of the fiscal stimulus with expectations of 3.5pc annualised growth in the third quarter. Even the UK, one of the worst-hit economies, is now showing signs of improvement in bank and mortgage lending and a pick-up in retail-sector confidence. Third, a key factor in Russia's economic prospects is the price of oil, which undoubtedly affects the domestic economic climate. The dramatic slump in oil prices that we saw in early 2009 seems to have been replaced with an ascending trend, and analysts have upgraded their 2010 Brent price forecast from $65 per barrel to $85. 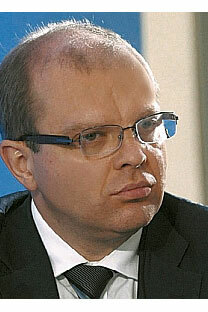 As Russia's deputy prime minister, Alexey Kudrin, noted at the Russia Calling! forum: "If oil prices do not fall below $58 in the next year and beyond, we will see a positive balance of payments." Elvira Nabiullina, Russia's minister for economic development, said that the official forecast for Russia's GDP decrease was still at 8.5pc, but in reality it could be 8pc or less. A rise in oil prices is bound to strengthen the domestic currency, which may be seen by Russian industrial producers as less than good news. However, the strengthening of the rouble is positive news for investors: high-yielding assets combined with a $/rouble decrease translates to extra profit. Incidentally, investors' trust in a strong rouble spurred on the Russian bond market in the third quarter of 2009. When the first signs of a strengthening rouble started appearing in May, the volume of corporate bond deals arranged in June-August more than doubled, compared to the March-May period. Many investors still cling to the stereotype that Russia has a limited range of quality investments, such as the oil and gas sector. One of the reasons we organised the Russia Calling! forum was to demonstrate the wide variety of foreign investment options in the Russian economy in fields that have nothing to do with commodities: retail, telecommunications, and manufacturing, for example. However, the domestic market is now coming up with new ideas in the fields of innovation, venture investments and infrastructure that could top investors' priority lists in future. Russia is taking its first steps on its way to creating an innovative economy, the key to which is creating an environment where talent and business acumen can be brought together. The focus of Russia's political leadership on the education and development of the individual is absolutely critical in this respect. Yet the question of where to invest remains a crucial one. The answer is to be one step ahead of the game. It makes no sense to try to replicate iPhones or IBM; what we really need are new things and new ideas. I believe that Russia has a competitive edge in nanotechnologies. That being said, Rusnano and VTB Group have launched the DFJ-VTB Aurora, an International Nanotechnology and Innovation Fund Family, in partnership with a leading venture capital fund Draper Fisher Jurvetson (DFJ). There are various forms of investing into innovations development. For example, Anatoly Chubais, CEO of Rusnano, says the state has approved Rusnano's plan to issue state-guaranteed bonds, totalling 180bn roubles. Also, Russian infrastructure is severely underfinanced: it currently lacks some $1.5 trillion and, in the coming 20 years, it will be necessary to spend $50bn per annum. According to Sergey Kelbakh, CEO of FGU Dorogi Rossii (Roads of Russia), in 2010-2030 planned spending on roads will amount to 60 trillion roubles, including 16 trillion roubles of non-budget financing. Many investors find Russia's business climate positive. One thing still hindering foreign investments is the level of corporate governance, which is considered to be rather low compared to that of developed countries. (Don't forget that the market economy is still something of a newcomer to Russia.) Nevertheless, the situation is looking up. The Federal Financial Markets Service is planning to introduce certain regulations (in addition to existing requirements): public companies would be required to disclose their ultimate beneficiaries, acquisitions, transactions by insiders and consolidated IFRS reports. Furthermore, to ensure compliance, fines and penalties for untimely disclosure are to be increased by a factor of 10. The call for improving corporate governance has been acknowledged by both market players and the government. As Karl Johansson, a managing partner at the Moscow branch of Ernst & Young, put it: "The country is at a crossroads, and to the extent that we can have a more consistent rule of law, and more focus on corporate governance, this would enable more capital to flow in." Since the early Nineties, Russia has been seen as a land of great opportunities. Despite challenging times, Russia has preserved its status of a country fit to invest in. I agree with the St Petersburg governor, Valentina Matvienko, who said that the crisis has not decreased Russia's investment attractiveness. Quite the contrary, it has offered new opportunities, such as undervalued assets, new investment spheres, and a strengthening national currency. All of these features can easily trigger investors' greed. Jeff Hines, CEO of Hines Interests, turned out to be the shining example of a success story at the Russia Calling! investment forum. In 1998, Mr Hines invested $100m in a Moscow project called Pokrovsky Hills. Within a few years, once the Russian economy took off, the company experienced enormous success, beating everyone's expectations.